Big Apple Crunch Takes New York! The Big Apple Crunch is an attempt to set the world record for the "Most Participants in an Apple-Crunching Event." This event will take place on FOOD DAY - October 24, 2013. New Yorkers can participate by finding a crunch near you: at any of GrowNYC's Greenmarket Farmers' Markets or another location near you or by hosting a crunch yourself! We want it to be the crunch heard 'round the world! Please pledge to take a bite with us at 12pm or at any time during the day that works for you. RecordSetter.com - a New York City based organization tracking new world records - will be tracking our progress towards having the "Most Participants in an Apple-Crunching Event!" 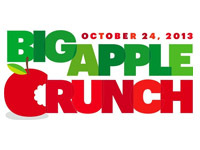 Read more about Big Apple Crunch Takes New York! 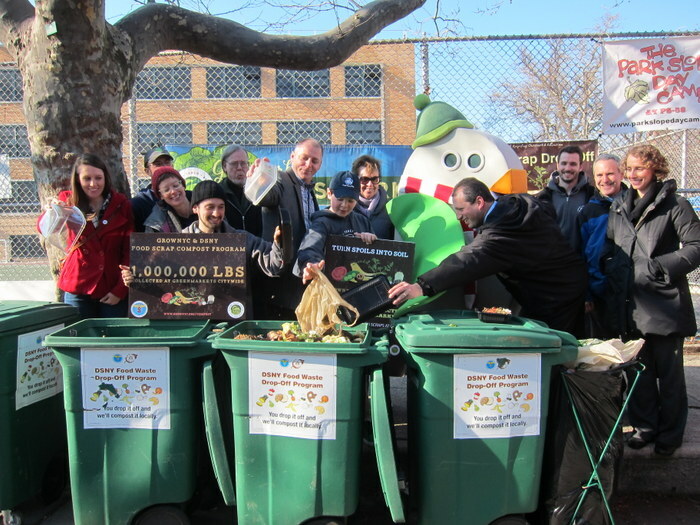 On Sunday, city officials, community partners, and compost enthusiasts gathered at the Carroll Gardens Greenmarket to celebrate a benchmark for GrowNYC’s food scrap collection program: ONE MILLION POUNDS! 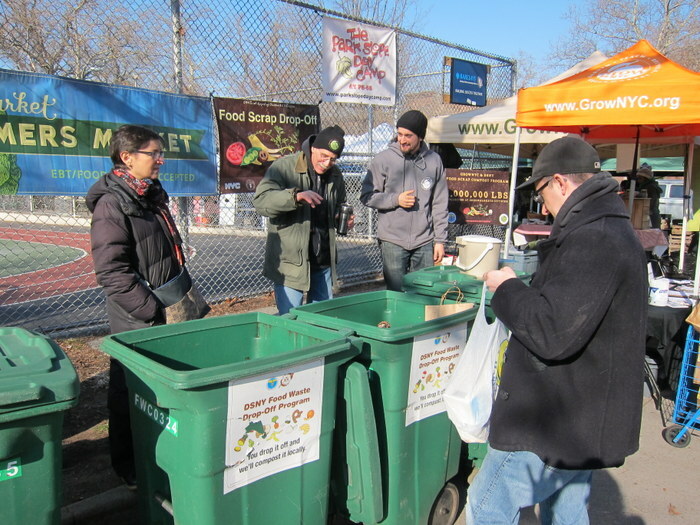 Since the pilot program launched in March 2011, one million pounds of food scraps have been dropped off at Greenmarket’s collection sites, diverting that much food from the waste stream. 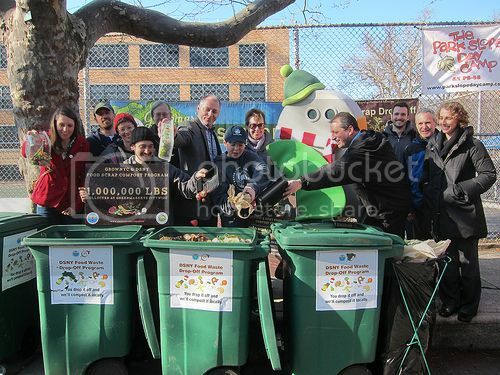 Emily Rubenstein, Assistant Commissioner of Sanitation, Recycling and Sustainability at DSNY, City Council Member Brad Lander, Birdie NYC and GrowNYC Executive Director Marcel Van Ooyen applauded the efforts of all those who have made this achievement possible. 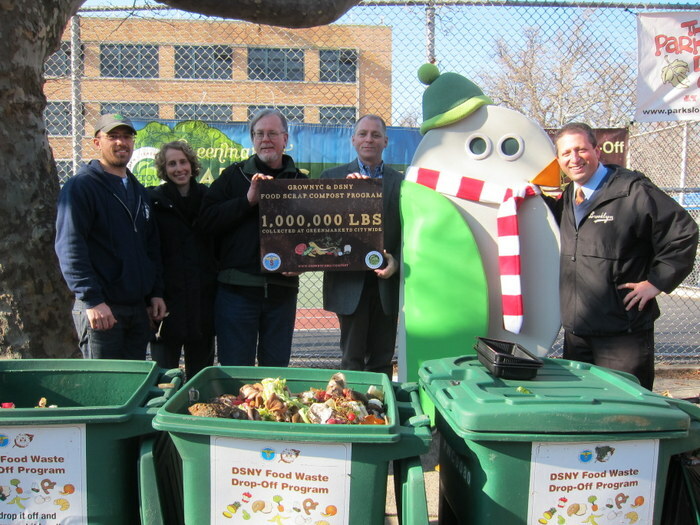 “We’re thrilled that Speaker Quinn and the New York City Council helped launch the compost program last year and that DSNY stepped in this year to bring the successful pilot to the next level. We’re demonstrating that the City of New York is not lagging far behind California and other places where compost has taken root. 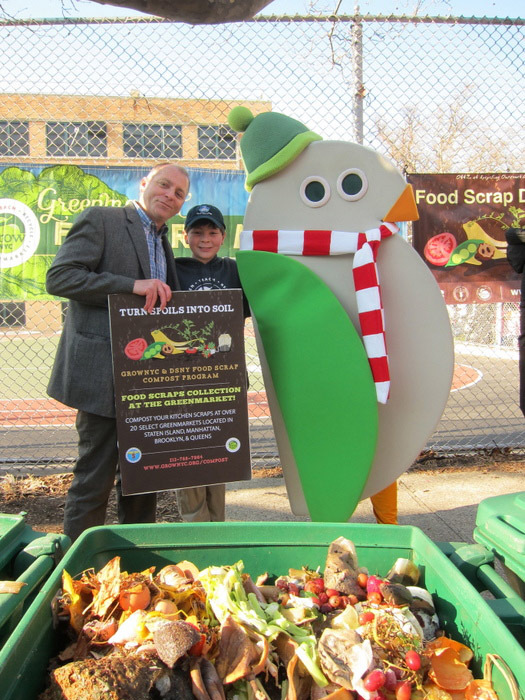 New Yorkers across the City are eager to participate and reduce waste while creating a valuable resource that will benefit local gardens and farms,” said GrowNYC Executive Director Marcel Van Ooyen. Look up your nearest food scrap drop-off site here, and find out what can be contributed here. 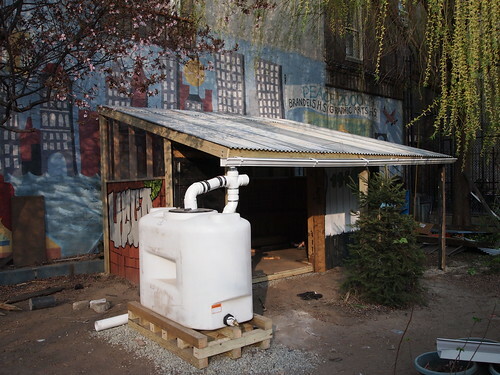 Once it’s dropped off, the material is transported to compost sites and urban agriculture projects within the five boroughs. We’re also signing people up for our winter incentive program—the Winter Compost Warrior. Visitors can sign in at our info tent when they visit the market, noting their weekly attendance and compost contribution. There’s a compost-related prize in it for those Winter Compost Warriors who check in ten or more times in the coming twelve weeks. At the beginning of the New Year, this monumental benchmark lets us set a new goal for the year ahead. How much compost can we make in 2013? Looking for a New Year's resolution you can stick with? One that makes you feel good, look good, and doesn't require a monthly membership fee? Look no further, here are 11 simple ways to make 2013 a happy and healthy year. 1) PASS ON PLASTIC. We know you have tons of reusable bags in your apartment; carry a few with you while shopping at Greenmarkets and give up plastic bags for good. 2) FALL IN LOVE WITH RUTABAGA. Boil them, steam them, roast them, or put in tarts, soups, or salads - turnips, beets, rutabagas and the rest of the root vegetable family are versatile and delicious. 3) DROP OFF YOUR FOOD SCRAPS. Start small – keep a bag of all of your carrot tops and coffee grounds in your freezer and drop it off at a market once a week. Your trash will start to have no odor - honest! Plus, think of all that rich compost being made instead of helping our landfills grow. Locations and times. 4) CLEAN OUT YOUR CLOSETS. Do your spring cleaning early and drop off all of your old textiles at one of 16 markets that collect year round. Locations and times. 5) JOIN A DINNER CLUB OR RECIPE EXCHANGE (or start your own!). Baby, it's cold outside. Warm up with friends and share dishes and recipes. 6) BECOME A WINTER WARRIOR. Stay devoted to Greenmarkets. The farmers that are there want to see you and most year round Greenmarkets (there are 22 of them!) have a frequent shopper program beginning in January where you can check in each week and get a fun market-y prize at the end of winter. 7) TRY A NEW INGREDIENT EVERY WEEK. Fresh horseradish, kohlrabi, celery root, creamed honey, purple potatoes - even in the winter, chances are pretty good that there are some ingredients at Greenmarkets that you've never tried. Take a closer peek and see what's there. 8) EAT AT A LOCAL RESTAURANT. For those nights you just don't feel like cooking (never, right? 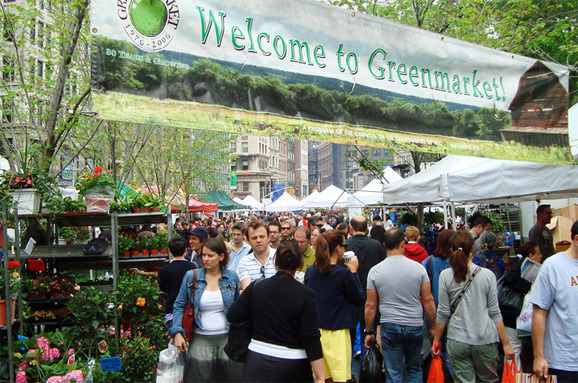 ), there are many restaurants around NYC that purchase from Greenmarket and Greenmarket Co. all year long. 9) VISIT A MARKET YOU'VE NEVER BEEN TO BEFORE. Explore New York City's greatest asset - its communities! With 22 Greenmarkets open year round, you have many opportunities to visit markets in Inwood, Jackson Heights, Cortelyou/Ditmas Park, and many more neighborhoods. Greenmarket map and schedule. 10) BECOME A GREENMARKET VOLUNTEER. Greenmarket hosts volunteer orientations and provides opportunities (indoor and outdoor) year round. 11) CREATE A MEAL USING LOCAL GRAINS. Can you think of anything better than homemade bread made with local grains slathered in some fresh farm butter? We can't either. Another ancient grain is roaring back to life in the city’s Greenmarkets and restaurants -- and this one is grown by farmers right here in our very own state. Emmer, the sweet, robust grain that adds dreamy texture to any soup or salad, grinds into a fine flour used in pasta and bread, and makes an incredible pilaf or hot cereal all on its own, is taking its well-deserved place in the spotlight. In just the latest example, Gramercy Tavern Executive Chef Michael Anthony is featuring emmer grown by Cayuga Pure Organics, a farm located in the Finger Lakes region, in the soup he created for Hale and Hearty and being served in its restaurants this week (12/10/12-12/16/12). Emmer, called farro in Italy, is among the oldest forms of wheat. Its cultivation dates back 10,000 years to ancient Egypt and Israel, where it was used to make matzoh as well as leavened bread, pasta and beer. It gradually fell out of favor because emmer seed has to go through an extra step after it’s threshed called dehulling, which removes the seed from its hull, or husk. 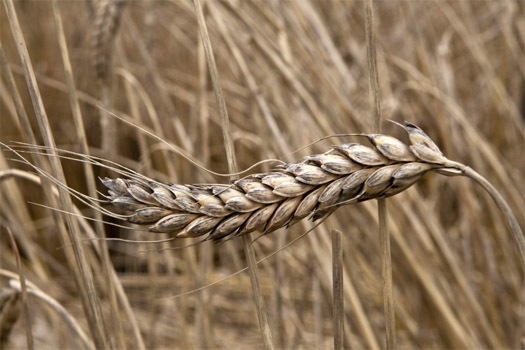 It was replaced by wheats that broke free from their hulls in the threshing process, like modern bread wheat and durum wheat (commonly used for pasta). Thankfully farmers throughout Europe, Turkey, and Ethiopia still appreciate emmer’s special qualities and grow it aplenty. The hardy crop hit American soil in the late 19th century, when German farmers migrating from Russia planted it in settlements across the northern plains of North Dakota and Montana. The USDA quickly spotted its merits: Not only was it extraordinarily high in protein and fiber content, but it proved remarkably tolerant to extreme weather, assuring a harvest even when the wheat crops failed. Emmer found its way to this region in 2009, when organic farmers in North Dakota who were willing to share this potentially high-value crop relatively new to the U.S. -- which they alone possessed – sent a seed shipment to organic growers in New York and Pennsylvania. The momentous hand-over was part of a USDA-funded collaboration among farmers, crop scientists and sustainable agriculture advocates (Greenmarket) intent on introducing farmers and consumers to this new-old grain. The group also hopes to clear the confusion people have between emmer, spelt and farro -- which has long frustrated farmers and researchers. In a rare show of annoyance, a 1911 USDA report cited the necessity “to protest strongly against the use of incorrect names for emmer.” Now that chefs in our region have their very own source of home-grown emmer -- no need to import farro from Italy anymore! 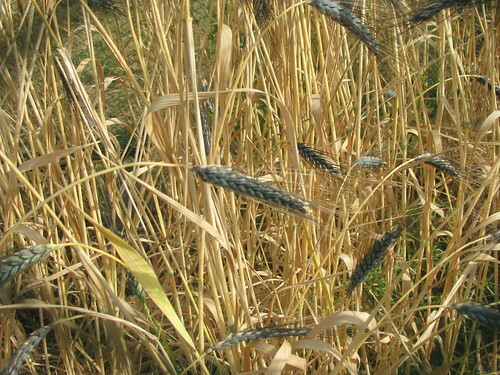 -- they are only beginning to discover the subtle differences between this hardy grain from the plains, and the crop of the same species that took another path to the Mediterranean, acclimating to Italian conditions over the years. Cayuga Pure Organics began selling emmer at Greenmarket, where it has been embraced by regional grain enthusiasts, including Chef Anthony. Chef Patti Jackson, late of I Trulli, made a memorable emmer pasta at a regional grains tasting in 2010 that folks are still raving about. With its rise in popularity, you can expect emmer to pop up more and more on menus around the city. You’ll surely see it in a range of forms, whether the whole grain, a bag of flour, a loaf of bread, fresh pasta or flatbreads. At some point in the not-too-distant future you might even be toasting an emmer beer or savoring an emmer whiskey cocktail. Local food for lunch just became that much easier to access. During the week of December 10-16, look for emmer, a locally grown grain from Greenmarket producer Cayuga Pure Organics, in a special soup at Hale and Hearty. The New York chain of popular lunch spots will feature guest chef Michael Anthony’s “Kabocha Squash Soup with Emmer and Cranberries” as part of its Chef Series of signature soups. The Gramercy Tavern executive chef and long-time Greenmarket devotee applied his penchant for local ingredients to a recipe that will reach the masses of noshing New Yorkers. It’s not uncommon to bump into Chef Anthony at the Union Square Greenmarket, which is just a few blocks from his acclaimed fine dining establishment. It’s a short enough distance to tote fresh products from the farmers market back to his kitchen via hand trucks. But Hale and Hearty has 28 restaurants throughout the city, as well as a 20,000 square foot USDA-certified commissary kitchen in the heart of Brooklyn. They serve 125,000 customers per week. Thanks to Greenmarket Co., GrowNYC’s new wholesale distribution service that delivers regionally grown produce to bodegas, groceries, and restaurants around the city, Hale and Hearty was able to receive deliveries of the same high quality, locally grown product Chef Anthony calls for in his recipe. This means more New Yorkers will be eating New York-grown food for lunch—a win for city eaters and upstate farmers alike. “The Chef Series came about in an effort to connect with some of New York's top Chefs while giving back to the community,” said Simon Jacobs, CEO. “This collaboration with Chef Anthony, Greenmarket Co. and God's Love We Deliver is bringing this idea full circle by not only donating a portion of proceeds to charity, but supporting local farmers by using ingredients grown in New York communities." Next week, 10% of each Kabocha Squash Soup sold will be donated to God’s Love We Deliver. What’s in the soup? Emmer, a regionally grown grain known to Italians as farro. Greenmarket Co. has delivered 250 pounds of emmer to Hale and Hearty on behalf of Cayuga Pure Organics, a farm located in the far north Finger Lakes region of the state. This integral farm to restaurant connection enables broader distribution of local ingredients on the wholesale level. It also means that even if you’re not able to make it to Gramercy Tavern for lunch, you can easily enjoy a locally-sourced bowl of soup at multiple locations around the city—likely there is a Hale and Hearty near your office! 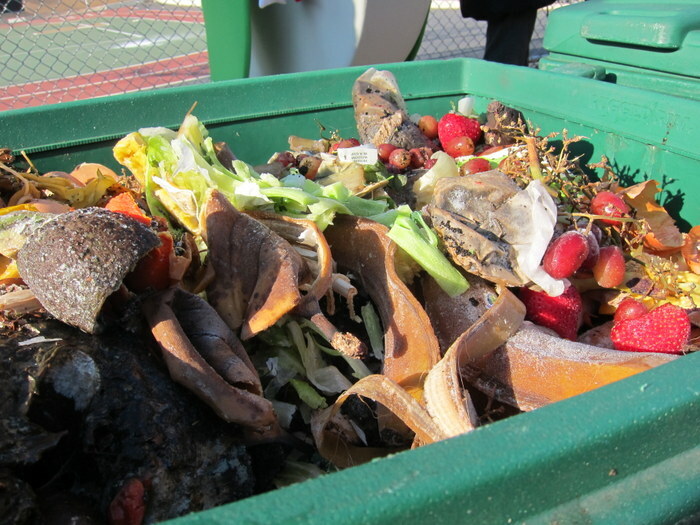 Does your local Greenmarket feature food scrap collection or textile recycling--or both? Find out below, and see what sites are closed for the season or suspended due to the holidays.